Apply for the Arch Grants Business Competition Today! Arch Grants, a new nonprofit organization aimed at creating a strong entrepreneurial economy and image of St. Louis, is awarding 10 or more grants of $50,000 each and offerring additional support to startup companies willing to grow their companies in downtown St. Louis. Intersted startups should submit their 1-3 page Executive Summary on the Arch Grants website.The deadline for apply for the Arch Grants Business Plan Competition is Friday, March 9, 2012. Winners will be announced in May. To learn more and apply, please visit archgrants.org/competition. Development Shop Productivity – Should You Outsource? CIOs, executives and development managers will find the most interest in this article. We’ll focus on a productivity measure for custom software development and how it may help you justify outsourcing your software development shop. How do you justify outsourcing your development shop when you know the immediate cost savings may not be there? The trend toward mega-software development outsourcing shops isn’t slowing down. But the gains to Fortune 500 enterprises are not always immediate. You’re gut says it to you every day: “It’s better to let someone else do this. We just aren’t good at developing our own systems. The bugs, the time, the bad requirements…” But, how do you justify your gut? I’ll skip past all the BS on the benefits and costs of outsourcing. You can look these up with Gartner, About.com or some independent analyst’s site. What I will present is a new formula for measuring your custom development shop value and tracking it relative to an outsourced effort. Let’s talk through it. CDVA is your development shop’s productivity. The first thing you’ll want to do is baseline this for your current shop over a year and then determine how it compares to any outsourcer’s proposal. The numerator in the equation represents your financial investment in custom development. The denominator represents labor expended relative to this investment. So over time you want to see your CDVA increase regardless of your outsourcing decision. If the trend goes down or stays stagnant then it’s time to seek improvement. There are some diminishing returns here, and you may need to make periodic investments to see greater value added later on. But the point should be clear; we’re measuring the return on our development shop’s productivity overall….rather than on a project by project basis ( which can be very misleading ). You determine the periodicity, but measuring this at every fiscal month makes sense to my inner accountant. You might ask why I chose measuring hours around bugs, requirements, and trouble tickets and not the overall development effort? Well….experience tells me these are the areas with the greatest variability and also the areas where expertise and experience shine. Those who are good at software and application development can do so with minimal bugs, less requirements analysis and their end product typically needs very little support ( I can see some CIOs smiling right now ). In previous posts I’ve talked about how written requirements are on the decline and how our development methodologies and practices, at least in part, are constructed to hedge the risk of misunderstanding requirements. As an outgrowth of those posts I’ll talk here about my vision for Requirements Documentaries as an alternative to written requirements and user stories. I hope by the end of this post a formula will emerge for crafting video based user stories into a persistable set of requirements documentation that captures much of the context around a project. How do you prepare the team for video recording? While the discussion should be as open and natural as possible: some coaching should be required here. Meetings of all stripes tend to deviate from their course and sometimes into topics that are not appropriate for the organizational culture. While these things can and should be edited out for the purpose of requirements documentaries; the team and customers should receive coaching ahead of time on how best to present their views and what topics/situations to avoid. Other good tips should be included like: speaking clearly and loud enough for everyone to hear, avoid bad behaviors ( picking nose, tapping on the table, etc ). We want it to be natural, but we also want it to be professional. 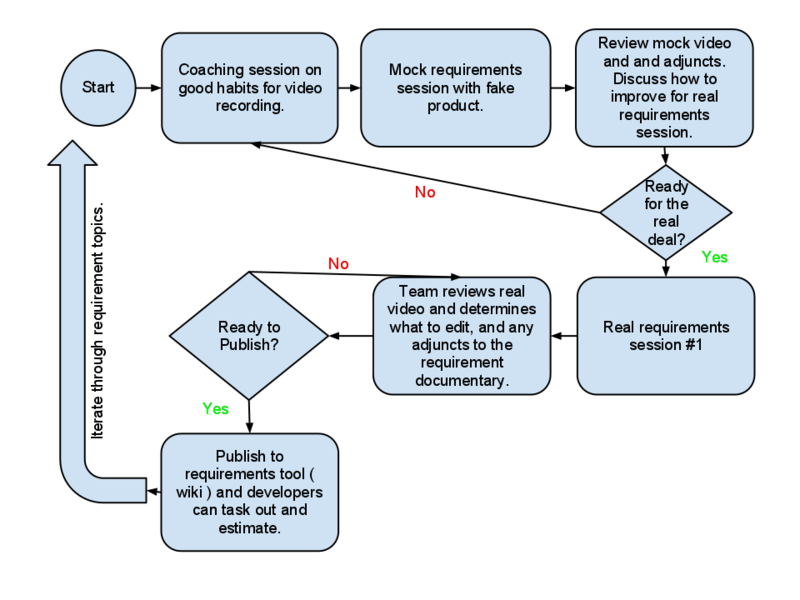 I believe this is a simple, cost effective set of tools that would serve as a basis for delivering requirements documentaries. Wiki or requirements gathering tool ( Jira for example ). A tool that can track versions. High quality video camera(s) with sufficient battery life and backup batteries. Digital camera to capture whiteboard sessions. -Video production: a solid understanding of digital video technologies ( hardware & software ) is important. But additionally the person should have some training/understanding of how to make a documentary. This would include how to edit the videos for applicability, ease of understanding, and dissemination to a heterogeneous audience. Furthermore, this role would understand lighting, how to stage a scene, and related concepts in film/video production today. -Facilitation & Coordination: any good requirements manager today has to have some level of facilitation and coordination skills. This will be instrumental when discussing the requirements, but also important in getting the right folks together to produce the documentary. Discussions could veer off course, and it will be important for the orchestrator to guide the group back to the topic so as to make the video relevant. -Detail Oriented: goes without saying, but with the video medium, details may need to be clarified through, what I’ll call, adjunct clips and whiteboard captures. So attention to detail doesn’t change, but the mediums of collection and dissemination may pose challenges for a traditional requirement’s managers. -Organized: just like today’s requirements the videos will need to be stitched together in some kind of wiki and organized in a manner that coincides with the software release. Any adjunct items ( whiteboard captures, additional videos ) will need to be issued as modifiers to the original video. In addition the orchestrator will need to keep his meetings, resources, and notes well organized. More preparation may be needed to gather requirements in this fashion, but the benefit will be the greater context it brings to the developer’s work. -Creative: a little creativity to make the videos more enticing and “watchable” would be valuable. However, we need to be careful here. Too much creativity and the videos become more of a movie than a documentary. The process below could be done in an iterative or waterfall fashion. It should be methodology agnostic. My recommendation would be to start using this on a small, non-critical project in your enterprise. See how it works and decide how to scale it from there. I see this as a technique pattern for situations where your requirements may change frequently, have a complex and intricate data domain, or your team is global. Lastly, I do realize this process is fairly basic……my intention is to start high level and as we see what works/doesn’t work we iterate back through and add more details or changes. Fear of the Camera – This is probably one of the most difficult issues. Some folks have trouble speaking up in meetings…let alone in front of a camera. So a sufficiently skilled orchestrator should recognize when this is occurring and attempt to bring that person into the conversation or, if completely unwilling to talk up, the orchestrator should pull that person aside, after the meeting, and have a candid discussion about whether they would like to continue participating. It may be necessary to get a proxy to stand in for him/her. Change – Using requirements documentaries is a big change in format. It won’t go smoothly at first and that’s why I recommend approaching it on a small non-critical project at first. Work out the kinks, and the issues with a group that sees the potential benefit. Use all your change management skills and recognize the loss cycle associated with any big change. Some may see it as opportunity, and yet others will see it as a threat. Equipment problems – one of the reasons I stress using 2 cameras ( video and still ) for recording the requirements events: Murphy’s Law. Legal, Organizational Policy Issues – in some countries and companies recording by video is against the laws or corporate rules. Check with your counsel before embarking on a project using a requirements documentary. Legal representatives and corporate leaders who see value in this method may need to sit down and amend rules to allow this form of requirements gathering. Politics – Recording things on video is a way of preserving the context around the requirements in addition to the actual meat, logic of the system. It’s intended benefit it to preserve for future team members and current team members the mood, background, motivations, and reasoning behind what they are building. This is the ideal side, but there is a less rosy edge to this. Politics arise in almost any company, and documenting decisions on video could open the door to misuse for devious ends. A company’s leadership embracing requirements documentaries should recognize this and put controls in place for those seeking political gain from manipulating the format. Requirements risk exists on all projects to a greater or lesser degree. The intention of this technique is to help mitigate that risk and provide continuity through time for a system’s definition. I don’t suspect this will alleviate all requirements issues. I’m too jaded by experience to think there are panaceas to every problem. But there is some good evidence in the world of psychology and Hollywood that motion pictures are more memorable and understood more easily/rapidly. You can see this for yourself. When you left the theatre after seeing “The Green Lantern” did you not understand it? Was it totally lost on you? Now what if I drafted that movie into a requirements document? Logic aside…my hope is that we can catch our requirements gathering process up with the technologies that we have today for gathering that information. If you try this technique….feel free to comment and let me know your experiences. I’ll be anxious to hear them. We commonly refer to Facebook, Twitter, and LinkedIn as social networks. But couldn’t these communities also be seen as virtual countries? This article attempts to explore the latent power behind these organizations and how they might effect, maybe even challenge, the traditional nation-state. What’s the difference between a gathering of people and a country? Boil it down and there isn’t much. Maybe scale? Maybe not. Knights of Columbus claims 1.8 million members. The country of Luxembourg….511,846. What about Geography? Countries typically own and occupy land…right? Yep…but what about the Vatican? Isn’t that a religous organization? Why do the Catholics have their own Sovereignty? Putting that aside…there’s plenty of organizations that own massive tracts of land. What would prevent Facebook from buying up thousands of acres and calling it ‘Facebookville’? How about taxes? Surely countries differentiate themselves on this level. But, alas, they don’t. As a member of LinkedIn you can join free, but more privileged services require you to pay. This is true of the nation state as well. Many citizens live free of taxes due to poverty levels, while others pay more than their share and receive better treatment in the eyes of the law. How about the ability to issue currency? Nope. Many social sites now offer their own private virtual currencies. If you’ve followed some of my tweets on @goldzee…it’s becoming clear that these currencies, unlike the early days with Flooz and others, may actually have legs to stand on ( the eWallet will enable it ). Furthermore, through virtual currency exchange sites, these virtual currencies may become convertible and trade-able. Probably the one area where nation states can and do differ from online communities is the ability to enact rules that, if broken by a citizen, and found guilty of breaking them, the citizen’s rights can be curtailed by force. Nation states can do this….I have yet to see an online community do that. Yes, Google could take away your Google + account, but you’re not in a prison cell after that action. Social Networks as bold experiments in redesigning the nation state? The similarities between countries and social networks are sufficiently complimentary to ask the question: are we experimenting with new ways to organize and manage a population of people? In other words…is this becoming more than just sharing your experiences from last friday night and making new friends? Is Facebook a challenge to the world order? There is evidence for this. Take a look at the recent Arab Spring. I wouldn’t dare propose that Facebook, Twitter, or Google caused this event. Such a view is absurd, but it can’t be doubted, as was reported by many media outlets, that the community of people in the Middle East who helped launched this revolution found *means*, even refuge in these social services. An abstract concept expressed in a virtual world…exploded into the real. That can’t be taken lightly if you’re a national government. More evidence goes to population sizes. Facebook claims 750 million members as of writing this article. That puts them just behind China and India. Freak you out? It should. Let’s say the average Facebooker has a salary of $10,000.00 a year. That would make Facebook’s GDP; $7.5 Trillion. In third place behind the U.S. and EU. The ability to influence, communicate and coordinate 750 million wealthy people ( I realize many be inactive users ) is nothing to be ignored. If influence is power than those who wield over the Facebook world are emerging titans. The population numbers point to how much people enjoy just being a part of Facebook. There’s no tangible product here. It’s not like billions and billions sold at McDonald’s. People aren’t coming to Facebook for consumption or service. They want to connect, communicate, and be part of something. Something. Cultural norms are something that identify a country. But increasingly the world is becoming one culture. The U.S. probably jump started the global culture thing, but a quick look at Facebook and Twitter shows how music, art, jokes, news, sayings, etc all flood through through their networked members at hyper speeds. Indeed these social networks are owning the global culture. Something that’s popular and gets tweeted gets re-tweeted exponentially and people talk about later. “Did you see that video clip on YouTube…HA!”. These things become our identity, our representation. More and more the world’s cultural borders are melting and we see more in common with some fellow 3000 miles away in Kazahkistan than we do with our neighbor next door. This is an unmistakeable challenge to physical countries today. Ultimately though, a grouping of people need a way to make decisions; voting in our physical countries. We use representatives ( proxies ) today to handle our decision making. But its been well known for decades that technology could circumvent the need to have politicians. So is there a way to decide and bind those decisions in a meaningful way? In some ways..yes. You can ‘Like’ something and Facebook has opened up some of its website governance to its users. But these are far cry from tough decisions like whether to go to war, send someone to prison, or enact a new law cutting healthcare benefits. Perhaps governing a virtual world is less demanding than governing a real one. But if we think these virtual communities could provide an experimental new society…then they’ll need to prove they have a way to manage these tough nuggets. So is there experimentation going on that resembles nation crafting? Yes…..but probably only as a side effect to pacifying member wishes. A real virtual country has yet to come. 2. Open and Beneficial for All – A true virtual country would be open. It wouldn’t be a place that was owned for the benefit of a few people. It would exist for the entire community. Facebook exists for it’s shareholders…like it or not. It’s motive is profit for them, not the people on the social network. A virtual country would change this by making each contributor a shareholder/owner of the network too. They would participate in any costs and share any profit. 4. Economy – Like any successful country the virtual one would require a market economy whereby owners find means to pursue their interests and livelihood. 5. Justice and Rule of Law – A way to mitigate disputes and resolve issues as well as a body of laws that provide guidelines for behavior are equally important. We often take these for granted, but let’s face it….no one wants to live in a country where everything boils down to how many armed men you command. Anarchy is the abscence of organization. 6. Legitimacy – Any social network hoping to claim itself as a country would need to seek legitimacy in the eyes of organizations like the IMF, United Nations, and others. This is a massive challenge because each physical country would see some threat in the inclusion of virtual countries. Would someone be a citizen of Zimbabwe, Virtual Nation X, or both? Could a virtual country claim each member’s home as sovereign territory? Would virtual citizens refuse to pay taxes to the physical country if they were doing so to the physical one? Ultimately, today, the social networks are businesses; not countries. They are seeking profit and they do this by satisfying their members desires. The more views, the more advertising dollars, and the wealthier they become. While each social network has some of the makings of a nation state….they aren’t directed on that purpose. The virtual world is not tied to Facebook, Twitter, or Google. It’s the other way around. It’s probably more likely that these networks will remain just a new abstract organization of people, but it’s fun to think of what could evolve and that was the purpose of the article. Android Smacking iPhone Around. When will Apple come play NFC? Sony/Ericsson is on board. Was Apple just caught off guard? Does nothing happen in Apple without Steve Jobs approval? Why are they missing this boat and letting the iPhone fall behind Android?